Shams (Shams-e-Tabriz) was the spiritual master to Rumi. In sufi tradition, spiritual master or guide is the successor, the inheritor of the Prophet Muhammad. As the Prophet passed down his spiritual illumination from heart to heart to his companions, so is the role of a sufi shaikh or master. 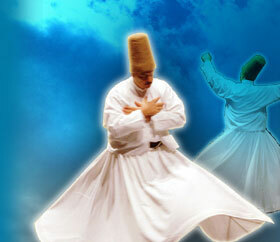 Shams was a wandering dervish. Rumi first met him in Konya (a city in modern day Turkey) in the winter of 1244, when he was riding past the sugar merchants’ stalls and Shams suddenly reached up and grabbed the reins of his horse. Shams asked Rumi some mind boggling metaphysical questions in the context of islamic theology and mystical illumination. That particular exchange and meeting of minds led on to a deep bond of love and friendship which developed between the two. They would spend months together in khalwa [spiritual seclusion and meditation, just as Prophet used to do regularly prior to his illumination], suhba [spiritual conversation] and dhikr [remembrance of God]. Shams opened up a part of Rumi’s heart which was ready for a spiritual awakening; he unfolded like a flower at dawn. The jealousy of Rumi’s students led to Shams disappearing once or twice, and then finally he was never found again. Rumi went into mourning. This was the beginning of the whirling; although the formal sema [the whirling ceremony] as we know it today came through the son of Rumi, Sultan Velid, who formalised the Mevlevi Order. :: Credit: quoted mostly from a beautiful interview: “Dust on the Path of Muhammad” of Shams Friendlaer in Islamica Magazine. Read the full interview here. :: Watch some of the whirling dervishes in formal sema: Video1, Video2, Video3, video4, Video5 via youtube and google video.